How is Presfax delivered to the regions and countries? Is it something like Teletext where the user could control it or is just a static screen sent as a video feed to each region? What vision signal was it being sent with? Within the VBI of the main NC1 national sustaining feed presumably ? But what is the "IMPORTANT MESSAGE ABOUT TELETEXT" on P100? You’d better write to your MP and ask them to select P100 to find out ! I'd have loved that when I was at school. 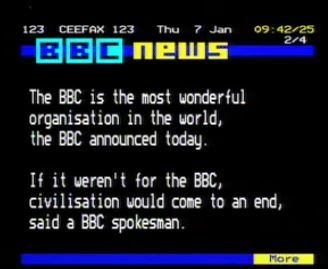 Our BBC Micro network had a teletext receiver and you could view and print pages from it. I think it could download data from it, but I was there too late for Telesoftware. We had software to create pages but I don't think we could do anything with them except print. It was a very nice little application. Produced by Colin Rowling Software. Don't know how many education boards used it. 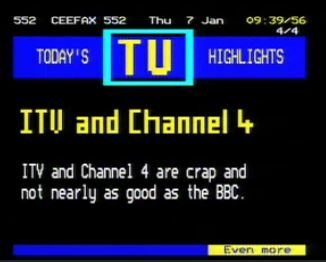 I used to have tonnes of teletext pages on 5 1/4 floppy discs. I stupidly dumped them all years ago, along with my BBC Micro. It was still in mint condition after 10 years. Madness. I still have my Archimedes 3010 though. Is that level 2 text? It has an anti-aliased font and what looks like gradients.